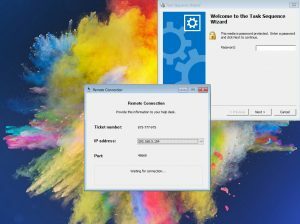 Any way Johan recently released an awesome PowerShell script to inject DaRT into a ConfigMgr boot image and configure remote control from the MDT Monitoring node using a launching script written by Alexey Semibratov. 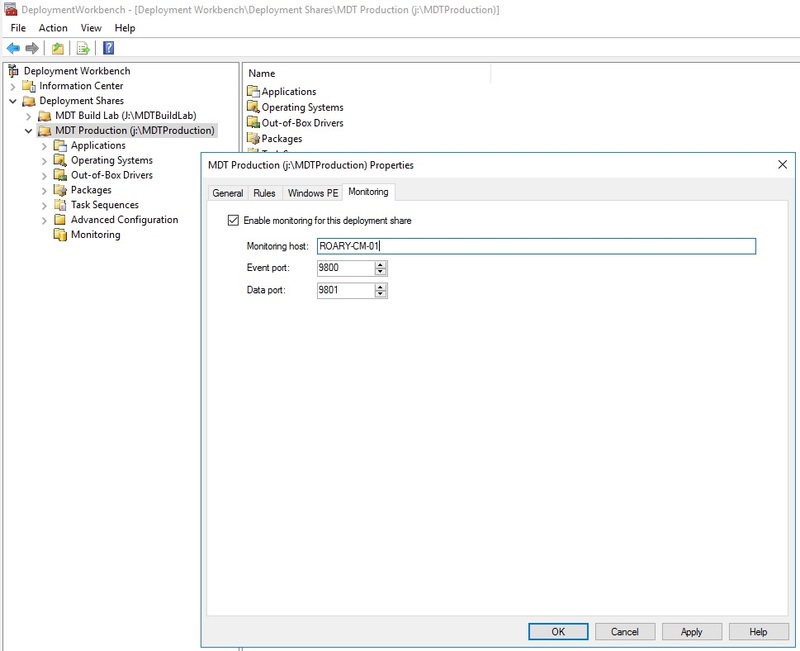 The beauty of adding this to your boot image is the point at which you are then able to remote control a task sequence, you can literally remote control the machine being built before the DP password has been entered, allowing the ConfigMgr Admin(s) to easily troubleshoot an issue. I want to make it clear that the original script was created by Johan and without his work I would not have come up with this. What I have done (having a spare Saturday) is tweak it a little to take parameters and configure it all. This means you do not have to open any files to change any information 🙂 I even update the XML for you, install Dart, the works! 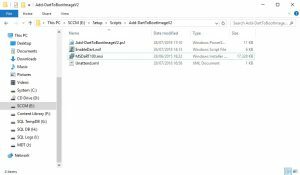 Copy all script files downloaded from above and your version of the MSDaRT100.MSI (DaRT 10 x64) installer into that folder as well. 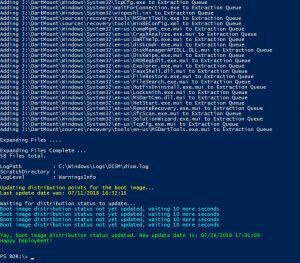 Next head over to you MDT deployment share and grab the monitoring service address. 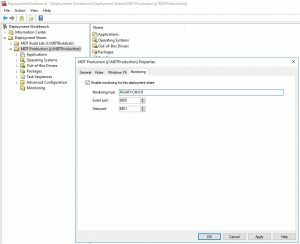 Now head over to ConfigMgr and grab the Name of the boot image you would like to enable DaRT remote control on. Once you have collected that information open a command prompt as Administrator on your site server. Ensure the drive you choose has enough space to mount the boot image as the script will create and clean up for you. 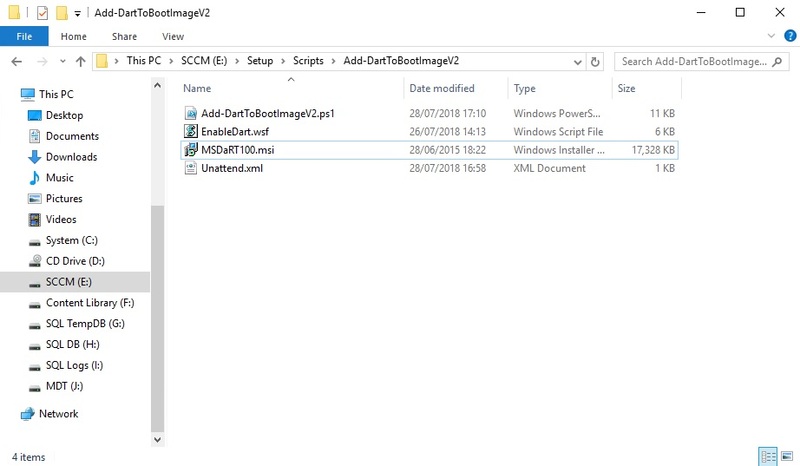 # Added default paths for installs MDT and Dart to speed up script for multiple Images. 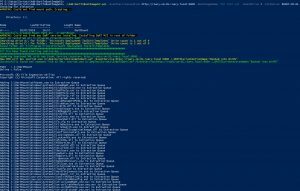 Write-Warning "Oupps, you need to run this script from an elevated PowerShell prompt!`nPlease start the PowerShell prompt as an Administrator and re-run the script." 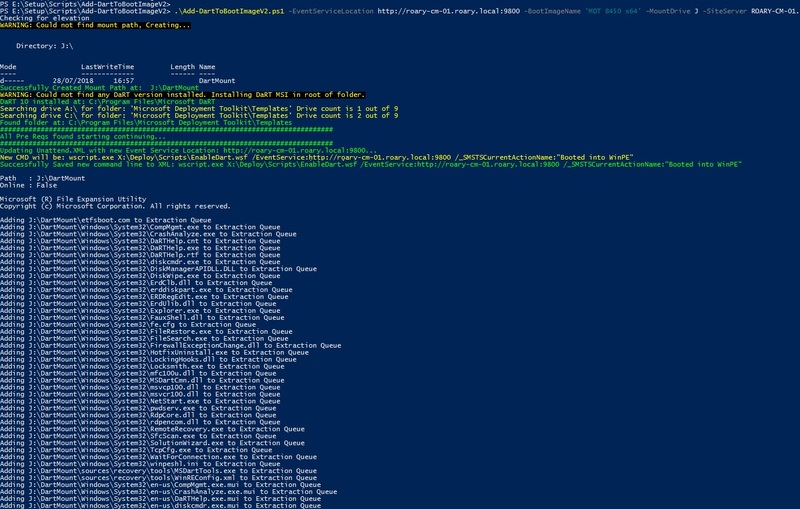 $MDTDefaultPath = "C:\Program Files\Microsoft Deployment Toolkit\Templates"
$MDTFolderName = "Microsoft Deployment Toolkit\Templates"
$DartDefaultPath = "C:\Program Files\Microsoft DaRT"
Write-Warning "Could not find mount path, Creating..."
#Check if dart is installed - If not install it. Write-Host "Dart is installed searching for CAB file location"
$DartCab = $DartInstallPath + "\v10\Toolsx64.cab"
Write-Warning "Could not find any DaRT version installed. Installing DaRT MSI in root of folder." 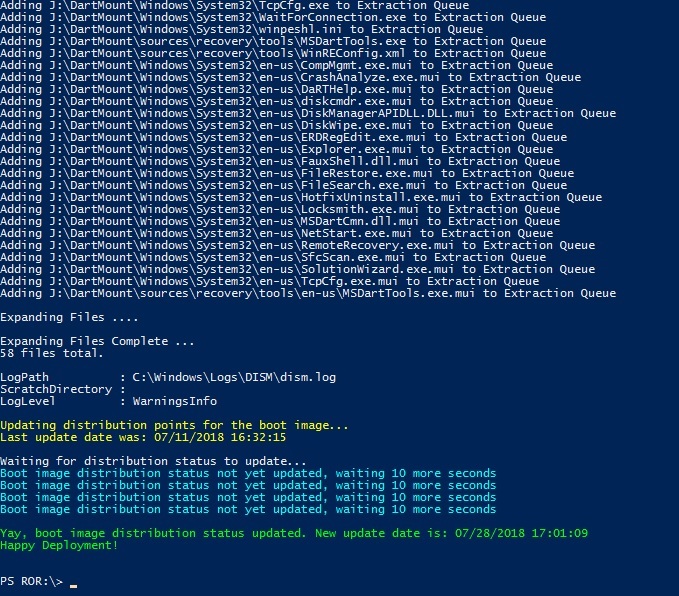 $DartArgs = "/i $DartMSI /qb /norestart /L*v $env:windir\temp\MSDaRT100_Install.Log"
$DartCab = "$ENV:ProgramFiles\$DartFolderName" + "\v10\Toolsx64.cab"
#Update Unattend.xml with new event service location. Write-Warning "Failed to Save new command line: '$($UpdateCMD)$($UpdateCMD)$($EventServiceLocation)$($UpdateCMD)' Error Message: '$($_.Exception.Message)' aborting..."
Write-Output "Waiting for distribution status to update..."